For several years now, many Theatre Odyssey productions have been brought to you by The Storyteller and The Music Man. John is a teacher, Housemaster, writer and director based in St Andrews, Fife. 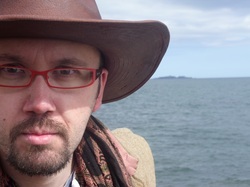 John founded Theatre Odyssey in 2000, when he adapted Homer's 'Odyssey' into a three act play. In 2001 this production was brought to the Pittenweem Arts Festival as 'The One-Man Odyssey', to great critical acclaim, and huge media coverage. 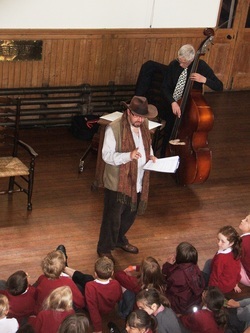 John's red glasses, leather hat and Indian Waistcoat have become part of the storyteller's enigmatic character. Since then, John has been telling the tales of Ancient Greece to children across the UK, including Fife, the West of Scotland, and South East England. Some of the myths John has explored include Oedipus, Orpheus, Daedalus and Icarus, Theseus and the Minotaur, and many others. John has particularly enjoyed working with composer and musician Brian Craib, and members of the Craib family, who help to bring these amazing stories to life. Brian Craib is a distinguished musician who hails from St Monans in Fife. Brian, formerly of the SNO, has taught music throughout Fife for many years. As a composer, Brian has written music for the 2006 Bradfield Greek Play 'Medea', which John directed, as well as many 'Mythodyssey' productions and shorter pieces for schools tours with Theatre Odyssey. Brian also arranges and composes music for many occasions including for local choirs and for professional strings ensembles.